Embodied within the Pesticides Act (1975) is the formation of a Pesticides Control Authority (PCA). The members of the Board are appointed by the Minister of Health and are made up of representatives from public and private sector organisations who have the expertise required for pesticide related matters. The Board meets monthly and sets the policies to regulate the industry in relation to the importation, manufacture, use, distribution and control of pesticides, among other things. 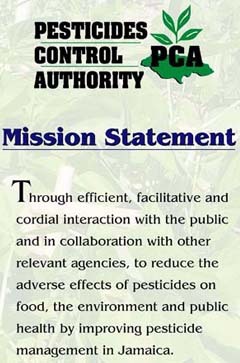 The Ministry of Health has portfolio responsibility for the Pesticides Control Authority (PCA). to do such other things as may be expedient or necessary for the proper performance of its functions under this Act.